Congratulations to Katherine Walter, Giovanna Carpi, Adalgisa Caccone, and Maria Diuk-Wasser for their recent paper, “Genomic insights into the ancient spread of Lyme disease across North America,” published in Nature Ecology & Evolution. 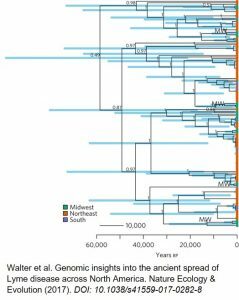 Using techniques in phylogeography to reconstruct the genomic history of Borrelia burgdorferi in North America, the team discovered that the most recent common ancestor of Lyme disease agent existed approximately 60,000 years ago. This suggests that the recent emergence of human Lyme disease is most likely a result of land use and climate changes during the 20th century rather than an evolutionary change of the bacterium. Read the full article here.